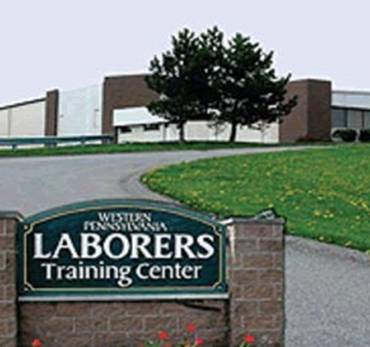 In the Western PA Laborers’ Joint Apprenticeship & Training Program, construction craft laborers receive on-the-job training and classroom courses from experienced instructors in construction language, care and safe use of tools of the trade, O.S.H.A., and First Aid/CPR. Applications are available on a continuous basis. The training site is located in Saxonburg, PA, with 51 acres of land and a 7,788 square foot training facility. Carpenters assemble and construct forms for concrete structures. Projects include bridges, retaining walls, tunnels, subways, drainage structures, hydro-electric developments, locks, dams and sewage treatment projects. Concrete is everywhere in the heavy and highway construction industry. A cement mason places, finishes, smooths, protects and repairs exposed concrete surfaces, such as sidewalks, driveways, roads, and dams. Laborers are used for various projects in heavy and highway construction. Laborers work with hand, power, and air tools, trenching and shoring projects, rebar, traffic control, soil compaction, and more. An operating engineer oversees the operation, maintenance and repair of heavy construction equipment including cranes, backhoes, loaders, scrapers and bulldozers. This equipment is essential for creating roads, dams, bridges and airports.